Despite most of the common gauges remaining the same over the last 60 years, the automotive dashboard of days past used very different technology to those today. Cable driven speedometers were common, along with mechanical drive for the odometer, too. Fuel and temperature gauges were often wired directly to their senders, and some oil pressure gauges actually ran an oil line right up to the back of the dash. Now, things are mostly handled over the CAN bus, which inspired [Thomas]’s bookshelf-based Mustang build. The idea behind the project is to build a nice piece of bookshelf art, using a modern CAN-driven Mustang dashboard. Through research and much trial and error, [Thomas] was able to figure out the CAN messages necessary to interface with a 2009 Mustang dashboard. There were innumerable hiccups along the way – [Thomas] had to 3D print his own connectors, reflash CAN bus interfaces, and make more than a few educated guesses to get things working. 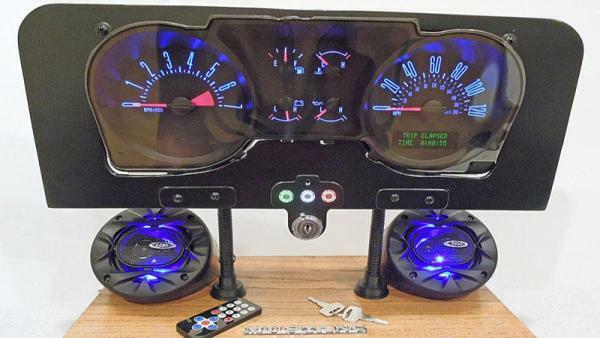 The dash is combined with an Arduino with an MP3 shield and a 30 watt audio system, which provides both CAN signals to drive the dash as well as the obligatory sound effects of a Mustang tearing about town. It’s all finished up with an ignition keyswitch and 3 LED-lit buttons in the traditional Mustang colors. It’s a fun build which does a great job of showcasing the basic tools and techniques required to interface with modern automotive subsystems. Salvaging an instrument cluster can be a great way to add immersion to your home racing sim, too. Video after the break.